New family-centered cesarean techniques are becoming popular in hospitals for C-section moms who want to “experience” the birth of their babies. In common cesarean section operations, the woman is strapped down, heavily sedated and with a monitor on her chest. 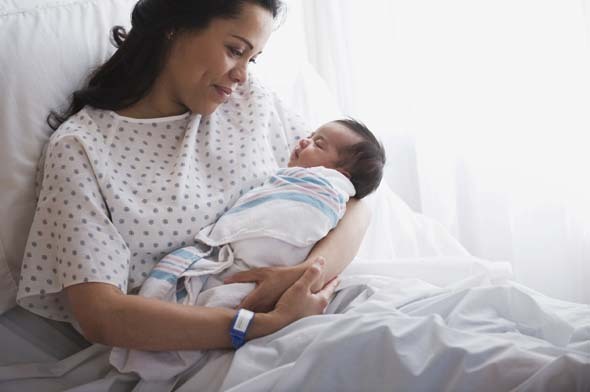 After the baby is born, the child is immediately whisked away for pediatric care. “It took me a long time to even be able to say that I gave birth to Avery,” said Valerie Echo Duckett, 35, recalling what she felt like after giving birth through the cesarean section. With the “baby friendly” and family-centered C-section, or, as they’re calling it, “the gentle C-section”, the mother is not strapped down, the monitor on her chest put to the side and the intravenous line put in her non-dominant hand -- all so she can hold the baby immediately after birth, even with the umbilical cord still attached. The aim is for the new mother to have immediate skin-to-skin contact with her child, stimulating bonding and breastfeeding. In some cases, the curtain dividing the mother and her baby is clear or lowered so she can see her baby being born. The father is also allowed to see the baby as soon as it arrives. England has already started to slowly catch on to the new C-section family-centered technique. The Brigham and Women’s Hospital in the U.S. is also pioneering the gentle C-section in the country.